Discover some of the latest products and services available in the retail industry…. Taymar Ad-Print notice holders offer a quality, contemporary and durable alternative to folded acrylic menu holders. The AP150 (A5) and AP210 (A4) are manufactured in the UK to the highest standards using crystal clear material ensuring your message is always in clear view. The main body of the unit is injection moulded creating a rigid frame. Literature is then positioned behind a PVC protective cover which is easily removed and replaced. Both of these counter top displays are available from stock and offered for distribution. 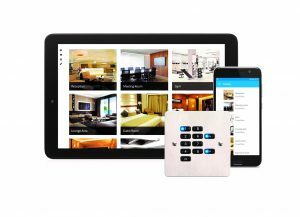 RAPID Scene Control solutions from CP Electronics gives the ability to customise lighting in commercial and retail buildings on a room by room basis using voice recognition and through cloud-based apps via a tablet or smartphone. This versatile, energy and cost-saving system works in conjunction with the system’s dimming lighting control modules (LCMs) and dimming luminaries. This integration allows RAPID to achieve advanced scene-setting capability across individual rooms and multiple floors. The use of a tablet or PC, especially if configured to voice recognition, provides end users with real convenience and ease in set-up. Using the simple command, “room recall”, the RAPID control system allows set-up of the lighting control within a single room, using voice only. Forbo Flooring Systems is pleased to announce the launch of Fabscrap, a new homogeneous vinyl floor covering concept, which uses excess chip material to create colourful mixes for a truly unique and playful design. 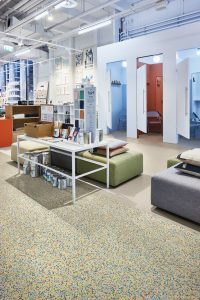 Taking sustainability and innovation to new heights, Fabscrap has been designed to reduce waste, by turning the excess chip mix from the production runs of Sphera – Forbo’s premium homogeneous vinyl collection – into vibrant floor coverings that resembles a colourful terrazzo and is suitable for an array of environments. Phthalate free, the multi-coloured speckled design of Fabscrap will contribute to healthier indoor environments. 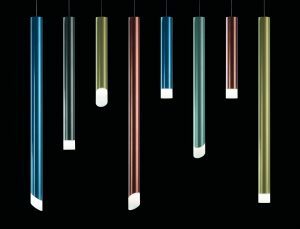 Presenting the new slim, contemporary Chyme Pendant designed and manufactured in the UK by Hacel. Offering Cylo and Accent etched design features, the Chyme is available in three lengths with a maximum size of 1050mm and delivers lumen outputs up to 1137 lumens and efficacies of 95 lm/W. Distinctive powder coat finishes establish the Chyme as an elegant choice; used as a single focal point or in a cluster arrangement to create an exceptional, artistic statement in surrounding architecture. 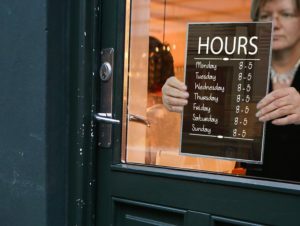 Display your A4 notices on the wall or in the shop window with the NH210. The NH210 is manufactured in the UK using of state of the art injection moulding technology and crystal clear material. The unit is clear all-round proving a double-sided display. Supplied with four clear adhesive pads, the unit can be mounted directly to glass to display your message in or out of the store. Alternatively mount directly to any flat wall. Literature is protected by the removable PVC front cover which can be easily removed to update your message or notice. 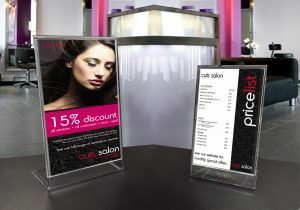 The NH210 is a rigid and long-lasting alternative to folded acrylic displays. To advertise in this section on the website and for more information about advertising your latest products in the magazine, please call 01787 222251 or email abigail@a1mediamagazines.com.